The transformation began subtly enough. One morning fording a creek, James realized the multitude of beavers in his life. There was his favorite childhood stuffed animal the cat used to hump. There was losing his virginity in a town called Beavercreek in a wooden lodge his high school girlfriend’s parents owned, and losing it on a rug stitched from beaver pelts that her father had trapped. There was even a taxidermied beaver mounted on the wall that surveyed the action! Then later, he dated a woman who lived in Beaver, Oregon and they once made love on a downed tree across another Beaver Creek. Summer on the Oregon Coast induces laziness in the locals, but not for James. He built a lodge entirely of beaverwood not far from the Honda. He happily moved the little gear that remained into the lodge and set up a cozy little home for himself. He donated all the rest of his possessions except the clothes on his back to the animal care thrift store. The clothes were already threadbare, and when they finally unraveled, well, who needed clothes when you’re turning into a beaver. James gave up making campfires. He stopped shaving, his hair grew out and dreaded, and groomed himself in the manner of riverine animals. He gave up all food except wild plants, foraging along the river, streams, intertidal areas and the nearby hills for sustenance. He ate better and more regularly than our boys at Valley Forge who subsisted on owl’s heads and and tree bark. James liked his stouts and porters, and one day, the pull tab on a can wouldn’t open. James had a pocket knife at the ready to make a repair, but he cast the knife away and simply punctured the can with his front teeth and shotgunned the beer in the process. A porter never tasted so good. Another day, James saw his reflection in a washed up Japanese float and noticed he’d lost all his teeth except two incisors on top and two on the bottom. They were orange in color. For a few weeks that summer, James kept his phone charged and occasionally texted friends. But at one point, the phone slipped out of his pocket and into a stream and that was that. James began taking short glides in the river at dawn and dusk. He was not alone. 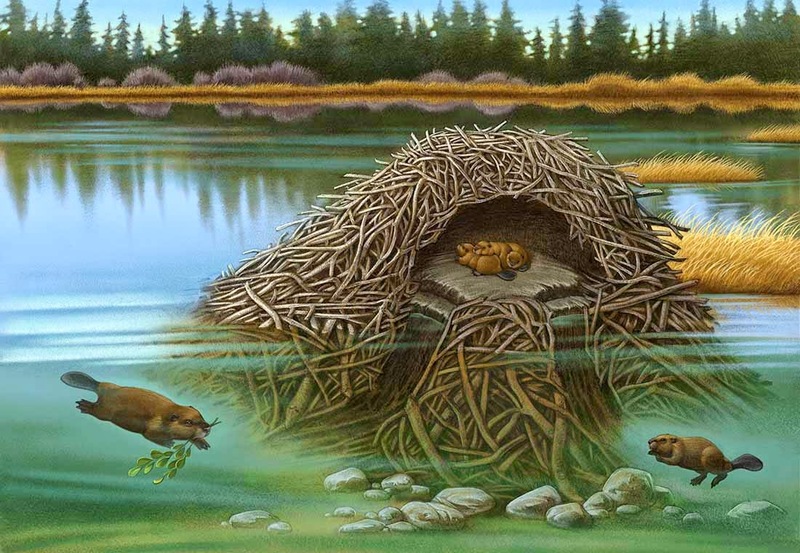 He knew beavers were out there, beavering in the side channels, the sloughs, the tributaries, building, building, building. He wanted to meet them. But how to initiate first contact? He still hadn’t found a suitable lodge to visit, although he had seen many dams. Where was it? One afternoon, it occurred to James that he hadn’t spoken a word of English in weeks. It was later that afternoon that he was hiking along a stream and he stopped, knelt down, and begin gnawing at a low hanging alder branch. Soon it detached from the tree. James gathered up the branch. He began stripping its bark with his teeth. He bit into the inner bark. Oh sweet cambium! Two hours later, James had felled a dozen young alders and willows and was utterly gorged. He fell asleep in some sedge and dreamed of babbling brooks.